President Obama wants the United States to have its own high-speed rail system like this one in South Korea. Washington (CNN) -- President Obama mentioned an $8 billion investment in high-speed train systems across the country in his State of the Union speech on Wednesday. Details released Thursday said the investment would be grants from the government's $862 billion economic stimulus package to begin the planning and initial work on creating the first nationwide program of high-speed intercity passenger rail service. Overall, projects and planning involving the rail corridors will take place in 31 states, according to a White House statement. Obama and Vice President Joe Biden were scheduled to travel to Tampa, Florida, Thursday to formally announce the program. Other Cabinet members and administration officials also were visiting sites of the program in other states on Thursday and Friday. According to the statement, the corridor between Tampa and Orlando, Florida, would have trains capable of traveling up to 168 mph with 16 round trips a day. 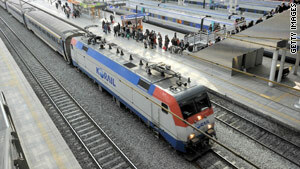 The time to travel by train between the cities would be about an hour, compared with about 90 minutes by car, it said. "This project will create jobs and generate economic activity as 84 miles of track are constructed, stations are built or enhanced, and equipment is purchased," with work expected to be completed in 2014, the statement said. "The projects announced today are part of President Obama's strategic long-term plan to transform travel in America by building and sustaining a comprehensive passenger rail program," the statement said. "In addition to the $8 billion awarded today, the plan also included $1 billion a year for five years in the federal budget as a down payment to jump-start the program." The statement described the program as "a long-term venture in which states will need to plan projects, purchase and lay track, build and assemble equipment, and construct or upgrade train stations, tunnels and bridges." "Spain spent two decades and $35 billion developing its high-speed rail system," it said. "South Korea took 12 years and more than $10 billion to build a line stretching from Seoul to Busan, comparable to the distance between Boston and New York." • New York - Montreal in New York and Quebec, Canada.